I’m in NYC for a week to visit friends and see as much theater as I can. On my first night here I ended up at the Booth Theatre to see the new play Velocity of Autumn because my friend is friends with one of the producers. I knew nothing about it, but when I saw that it stars the legendary Estelle Parsons and Stephen Spinella, I was in! And it turned out to be a great way to kick off a week of NYC theater. As my friend said after the show, “this is why this exists, this is why there is theater.” Velocity of Autumn is one of those two-people-sitting-in-a-room-talking plays, and it’s beautiful. Very real and honest, rich and full. It’s really a character study of two people at a pivotal moment in their lives, and explores their connection as well as their individual life goals and choices. 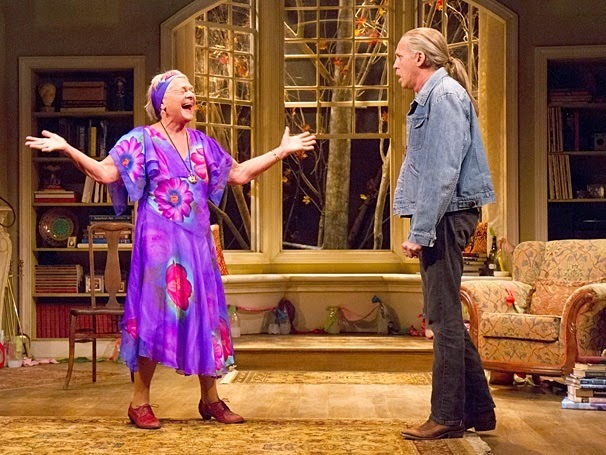 The play opens on 79-year-old Alexandra (played by 86-yeal-old Estelle Parsons), who has barricaded herself in her Brooklyn home, armed with home-made explosives. Her children are trying to remove her from her home and put her in a nursing home, so she’s refusing to let anyone inside. Her long absent youngest son Chris (Stephen Spinella) climbs a tree and into her window in the hopes of talking her down. What follows is an intense and revelatory conversation between these two people, both at a crossroads in their lives and unsure of what’s going to happen next. What Alexandra is really trying to barricade out of her life is age – the loss of herself. Chris is the one of her three children that is most like her, an artist and a free spirit, which is how she raised him. He gives her what she needs – someone to listen to her and acknowledge her fears. Chris has recently experienced a life-changing event of his own, which is why he’s decided to come home, for a chance to “do the right thing.” As they talk about their shared past, and the uncertainty of the future, they come to a bit of an understanding, although nothing is resolved for certain. It’s a clear and precise depiction of one moment in these two people’s lives, lives that existed before this moment and will continue to exist after. I attended a post-show discussion and an after party at Sardi’s, and it was so illuminating to hear that so many people have a similar story to Alexandra’s in their life. The director Molly Smith made a really great point, that the action of this play is not just on stage but in the stories of the audience and how they relate to what’s going on on stage. Which allows for Estelle and Stephen to be “listening, responding, and living together on stage.” That’s the absolute best kind of theater. These two actors are so comfortable with each other and their characters (the production recently moved from the Arena Stage in DC), Estelle especially is just a genius at inhabiting the skin of this complex and fascinating woman. A few words about the set by Eugene Lee, because it’s important to visually create this world. The lived in and once comfortable apartment is surrounded by bottles of flammable liquid, with most of the furniture against the door. Looming over it all is a huge tree with autumn leaves, a tree that Alexandra loves and has fought for and lived with for years. It’s a tree that is strong and rooted in that place, but that is quickly moving through autumn towards winter, just like Alexandra. I would love to see this play produced in Minnesota soon. I spoke to the playwright Eric Coble, who was inspired to write the play after an encounter with a neighbor but also drew from personal experiences, and he said he hasn’t had much of his work produced in Minnesota, despite being based in Cleveland. They were lucky enough to get their first choice for the role of Alexandra, but he said that every community has their Alexandra. I think our Alexandra is Ivey Lifetime Achievement Award winner and McKnight Foundation Distinguished Artist Wendy Lehr, and I would love to see her tackle this role at the Jungle Theater. In the meantime, if you find yourself in NYC, forgo the usual big splashy musical (which, don’t worry, I will see on this trip) to see this beautifully written, fantastically acted, poignant, relevant, smart, funny play.